She looks absolutely amazing by the way , I'm very envious ! I've tried it all with Shayna over the years . Bottom line is she eats when she wants. Sunday is feed day here, so I feed either 7 or 14 days, etc. I'll offer again in two weeks. Also, the past few winters she took a rat or two over the 4-6 months before beginning to feed regularly again. I appreciate the input on handling. Aside from the pics I took her out to clean her tank and that was it. I always leave her alone completely the day of feeding and often the day before as well. I have had better success defrosting at room temp and then dropping the rat in hot water for 30 seconds or so instead of using the hairdryer. Seems to more uniformly heat the rat and she is more likely to take it. I know many people have success with the hairdryer and my other two snakes (BCI and Corn) will eat anything, prepared anyway! Again, when it comes to eating, especially in the winter, she does what she wants and on her schedule, not mine! Being a healthy weight, color, drinking regularly, and this being her yearly winter thing, I am not worried. Thank you for pointing out how beautiful she is; I agree. She is a totally awesome snake all around! Last edited by dakski; 02-19-2018 at 08:51 AM. So, Shayna happily gobbled down a medium rat tonight! I am moving to feeding every two weeks now. Reviewing my records, she would often eat every week, when not in fast, but then refuse a meal or two. She didn't strike as usual. Waited for me to drop the rat and walk away. I hid in the corner, out of her sight, and about a minute later, she began eating. Got it down quick too! Very happy she is off fast! I don't worry too much, and I know she will eat when ready, but it's so much more fun when they eat regularly! Well, the winter fast is definitely over! She is going to shed, but still gobbled down a medium rat last night! I shook it, put it down (which she prefers), and came back two minutes later to her chowing down. I am feeding her every two weeks and she has been eating like a pig! Good deal! That's 3 rats in the past 6 weeks, after not eating for 5 months. Glad she is eating again; it's so much easier on me! This morning I found a beautiful Shayna, along with a perfect shed, and a bunch of waste! I'll post pictures soon, if I remember, but she doesn't look much different than last shed, LOL. She's been full grown and had the same colors for a while. I also weighed her and she came in at 1600G even, which is her normal weight when not fasting. I think she's a little less because she had a 100G rat Sunday night. Either way, definitely gaining weight back to her normal and up from her low of 1430G before her yearly winter fast ended 6 weeks ago. She's an awesome snake, but funny! I picked her up out of her tank to clean it and gave her to Katie to hold for a few minutes (Katie got out early today because of the Noreaster!). She was doing great, then when I took her back, and draped her from my neck, she bumped her head into my chest, freaked out, bolted backwards, hit the back of her head against my hand, then bolted forward, and hit my chest again! She can be such a spaz! She spooks so easily, but also gets over it, virtually immediately. Good thing she's not a biter, otherwise I am sure she would have nailed me with how easily she freaks out! Really, she is an incredibly gentle soul. 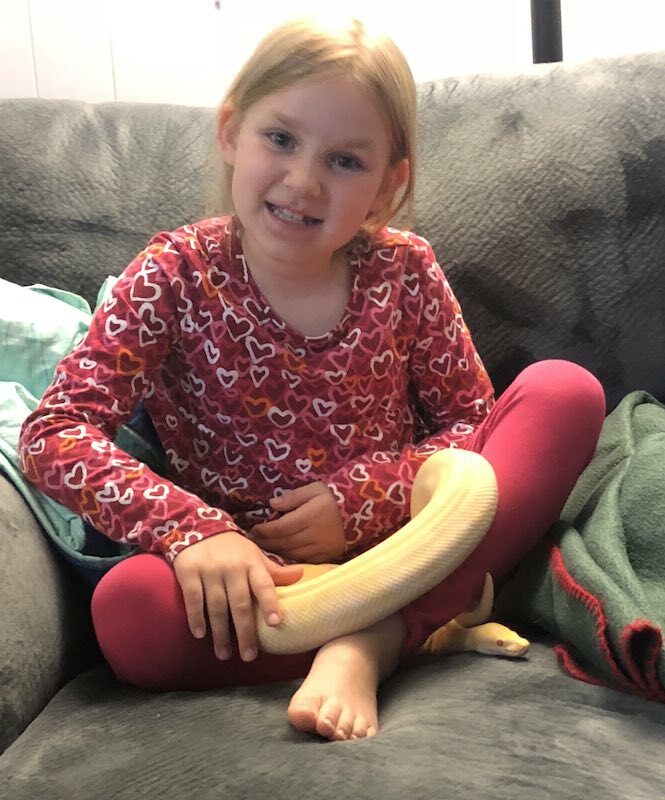 My niece, Meghan, came over tonight and loves the reptiles! Shayna is her favorite because her favorite color is yellow. Shayna has known Meghan since Shayna was about 6 months old and Meghan was 2! They are buddies. Obviously, Meghan didn't have as much responsibility/freedom with her or the other reptiles when she was younger. 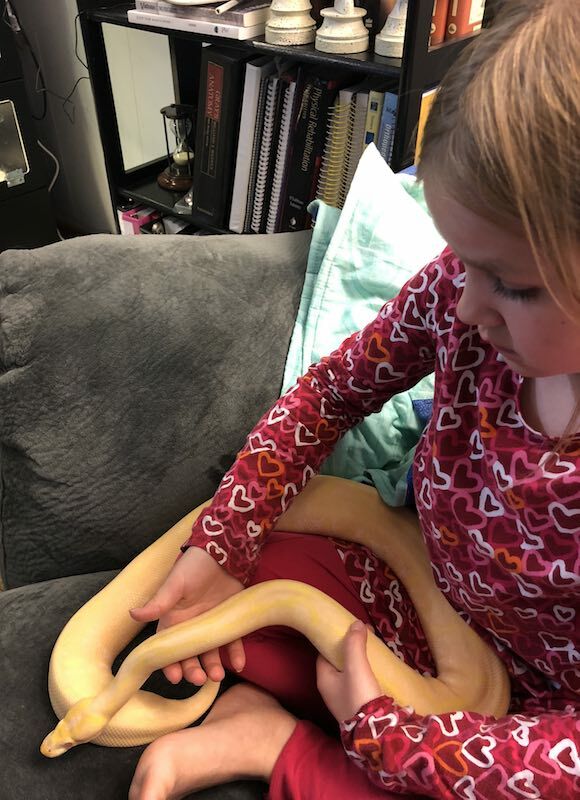 She's 7 now and I am allowing her to hold the snakes now (while supervised). Outside pictures - 80F today! Amazing looking snake for that combo. 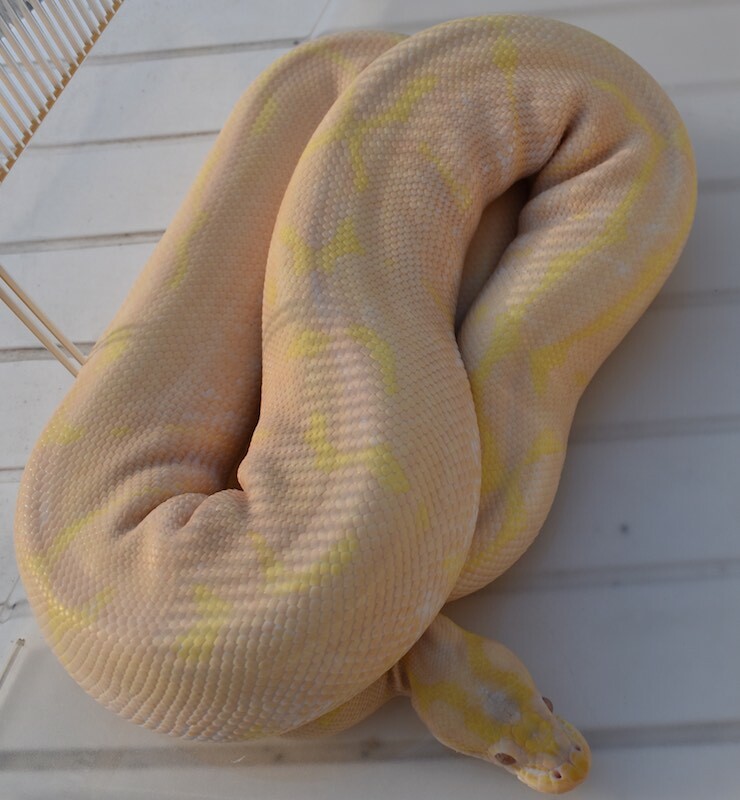 Albino has always been my fav recessive and whatever line yours came from is gorgeous with the spider pattern. 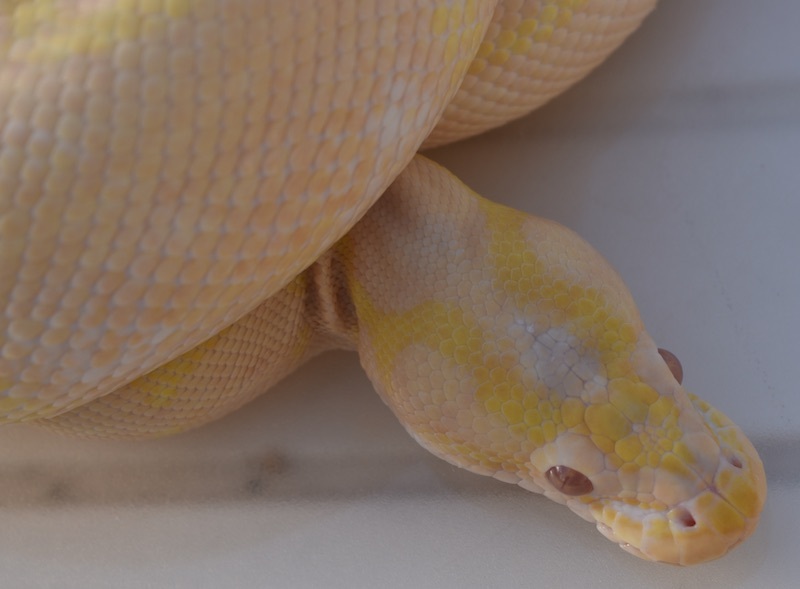 Of course, 2 days after I took this picture, Shayna's eye clouded over, and she shed last night. Can't wait to get some pictures of her with fresh paint in the next few days!